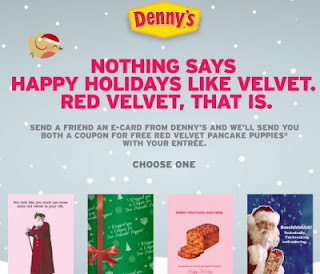 Send a friend or family member an e-card from Denny’s and they’ll send you both a coupon for FREE Red Velvet Pancake Puppies with purchase of an entree at Denny’s! Entree must be $2.50 or more. Limit one coupon per check, per visit. Coupon valid thru 12/29/12.